Chocolate Cranberry Cake is so moist, tender, and studded with chocolate and cranberries! A perfect cake for the holiday season that is super flavorful because of a secret ingredient. You have to give it a try! Adjust the oven rack to the lower third position and preheat oven to 350°F (177°C). Grease and flour a 9.5-inch (10-cup) bundt pan. Set aside. In a small bowl, whisk the flour, baking powder, and cocoa powder together until combined. Set aside. In a large bowl using a handheld or stand mixer fitted with a paddle attachment, beat the butter, granulated sugar, vanilla extract, salt, and cinnamon on medium to high speed 8 minutes until smooth and creamy. Scrape down the sides with a spatula as needed. On medium speed, beat in one egg at a time - mix for 30 seconds after each egg. With the mixer on low speed, add the flour mixture, the red wine, the dried cranberries and the chocolate - mixing each addition just until incorporated. Avoid overmixing, but whisk out any big lumps. Pour batter into your prepared bundt pan. Bake for around 50 minutes or until the cake is baked through. All ovens are different and your cake could take a little more or less time. To test for doneness, insert a skewer into the center of the cake. If it comes out clean with only a couple moist but not wet crumbs, it's done. Let the cake sit in the pan for 15 minutes then transfer it to a wire rack. The cake must be completely cool before glazing. Make the red wine glaze: In a small bowl mix together the powdered sugar and 2-3 tbsp Red Wine. 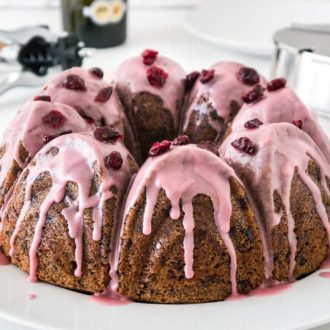 Glaze the cake with the mixture and decorate it with dried cranberries.